Thick glossy paperback cover, a very high quality full-sized cookbook 7.5" x 10.5". Features a 5 page introduction with explanations and pictures of relevant Thai ingredients. 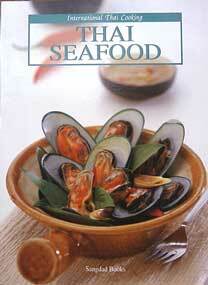 There are 46 Thai seafood recipes, such as sour and spicy seafood soup, fried crab in curry sauce, and other favorites. All pages are top quality photo-grade paper, featuring a large full-page color photograph of each recipe in completed form, pictured in a royal setting with beautiful Thai tableware. This is not only a good Thai cookbook but also a work of art and great for coffee table presentation. Imported From Thailand. Each recipe written in English and Thai. Click image to enlarge.